In 2015, Run Mindful was created as an avenue to share our values of mindfulness, running and healthy living. As we have connected with runners from around the world during the Run Mindful retreats, we’ve seen how a strong voice in a community can influence how people think about mindfulness. As the Run Mindful team cannot visit every city to speak about our journey to mindfulness, we’ve decided to identify runners who embody the mindful virtues we value and empower them to be the voice of mindfulness within their community. 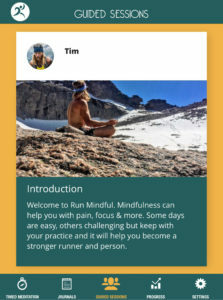 Run Mindful started as a passion project. We believe in mindfulness as key to healthy living and want this message to reach as vast an audience as possible. Thus, it is with great excitement that we are launching the Run Mindful Ambassador program. The Ambassador program will help further connections between our running communities and highlight the amazing people who are already spreading these positive messages. We will be accepting applications until 5/1/19 and will announce the 2019 Run Mindful Ambassadors shortly after this date. Share running and mindfulness with your community as it makes sense for you. We want this to be an organic process, so utilize the means best fit for your personality and your social sphere. Examples are group runs or yoga sessions, social media, guided meditations and group talks, or word of mouth campaigns. The goal is to involve people in your community to pair movement and mindfulness in the best method for your personality. We want to hear from you on the best means to spread the word within your community. The possibilities are endless. Represent the values of Run Mindful within your community and in your social media presence. Engage with and support other Ambassadors in your area for group events. Provide feedback to the Run Mindful leadership team on mindfulness initiatives in your community. Maintain availability for regular touchpoints with the Lead Ambassador and Run Mindful Leadership team. Continually demonstrate positive energy with your Run Mindful interactions within your community. Be open to speaking on the role mindfulness plays in your life and ways you use mindfulness with people in your community, other Run Mindful ambassadors or retreat attendees.